1) This paper has been presented at the 5th FIG Regional Conference – Promoting Land Administration and Good Governance to be held in Accra, Ghana, March 8-11, 2006. Key words: wrecks, danger to navigation, charts. Hydrographic surveys measure and define the configuration of the bottoms and adjacent land areas of water bodies, especially as they pertain to navigation. This information is critically important to the production of nautical charts and is, also, useful to the fishing industry and coastal zone managers. They are the primary responsibility of the Coast Survey's Hydrographic Surveys Division, like Nigerian Ports Authority (NPA), National Maritime Authority (NMA), National Inland Waterways Authority (NIWA), etc. The primary product of a hydrographic survey is a smooth sheet. The smooth sheet depicts corrected depths relative to an appropriate vertical datum (usually a water level datum) along with relevant shoreline derived from a variety of remote sensing techniques. Smooth sheets also depict hazards to navigation (rocks, wrecks, obstructions, etc. ), shoal developments, channel delineations, aids to navigation and landmarks. The principal objective of hydrographic surveys is to obtain basic data for the compilation of nautical charts with emphasis on features that may affect safe navigation. In addition to measuring water depths, surveys identify hazards to navigation, delineate channels, and verify aids to navigation and landmarks. Each survey represents a comprehensive record of the coastline and adjacent waters. A record of changes caused by natural processes and human activities can be compiled from a review of contemporary and prior surveys of the same area. In the Maritime industry, “wrecks” refers to a vessel that is sunk, stranded, or abandoned in a harbour, dock, pier, tidal water, or port approaches under the control of a harbour authority. Wrecks include jetsam, floatsam, lagan, and all derelicts (including logs) floating or submerged in the tidal waters or the operational shores of a nation. Wrecks are viewed with seriousness, in international shipping, because they constitute danger to navigation, and to lifeboats engaged in rescue operations and other services at a country’s harbour and waters. The International Maritime Organisation (IMO) insists that member countries have a clear waterway and a regime of clean navigable waters. In developed countries, very special attention is given to the issue of wrecks. Apart from imposing stiff penalties on owners of wrecks, the English Law also empowers nearly all harbour authorities with dual and, to some extent, overlapping power to remove wrecks where the wrecks pose significant dangers. 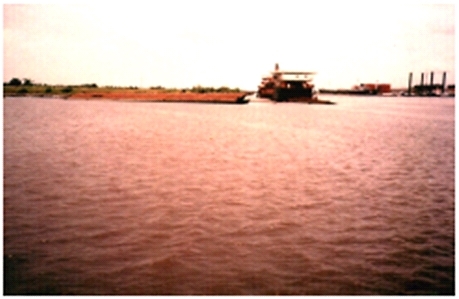 Although Section 273 of the Merchant Shipping Act Cap 224 Laws of Federation of Nigeria 1990 contains some provisions on “Dealing with wrecks” the Act is not adequate on how to promptly deal with the issue of wrecks, even when they constitute serious danger to navigation and/or the environment. It is not surprising, therefore, that wrecks litter Nigerian waters, posing various risks to navigation, pilotage, search and rescue, recreational boating and routine patrol. In recent times, there have been reports of abandoned ships at the ports and territorial waters of Nigeria, constituting danger to navigation, and threat to national security. Although there are Government Receivers of Wrecks in each of the country’s ports, no significant efforts have been made to firmly address the matter of wrecks, or improve the condition of wrecks on Nigeria waters. Non-availability of funds to promptly address the issue is reported to be a major consideration for this lack of significant effort. Security risk, as abandoned vessels could be used as hideouts for criminals, especially robbers. Government recognizes these problems, and had made some feeble efforts in the past to address the problems. This observation is included in the findings of a Federal Ministry of Transport Ministerial Committee on Wrecks in Nigeria. According to the report of the Ministerial Committee, two Committees had been set up previously. Firstly, on October 5, 1988, Maglee Salvage Company entered into contract with the Federal Ministry of Transport (FMOT) for the clearance of wrecks, derelicts, floatsam, and other obstructions from the nation’s navigable waters, ports, dockyards, and shorelines. A change in government policy, via Circular No. SCD/2/320/1/233 of 6 February 1990 reviewed all agreements entered on behalf of government for sales and export of scrap to avoid further export. This circular put an end to the contracts. This initial effort, which involved a detailed listing of the location of the scraps, and full mobilization for removal, were aborted. To identify and position the wrecks, derelicts, floatsams and similar obstructions within the navigable waterways of Nigeria (including international and local ports) etc. Suggest the best economic ways of clearing the obstructions (with the financial implication) of the same. 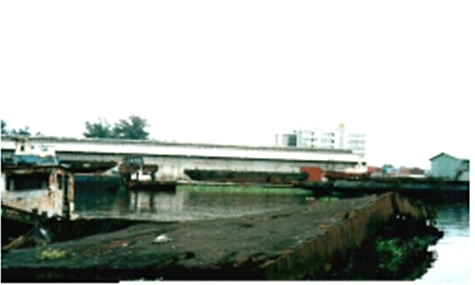 To collect, compile, collate, and coordinate inputs from the Nigerian Navy (NN); Nigerian Ports Authority (NP Plc); Nigerian Shippers’ Council (NCS); Government Inspector of Shipping (GIS), and the Inland Waterways Department (IWD) of the Ministry, on the identified and identifiable location of obstruction on all ports approaches and navigable channels. To use relevant base maps and plot each point of location by indicating the longitude and latitude of the same. While focusing on the approach of ports and navigable channels, efforts should be made to draw the line between the obstructions that constitute immediate navigation problems and those that were not in their respective vicinities. Suggest the best economic way(s) of getting rid of the obstructions and, where necessary, identify safe passages around any serious obstructions, with attendant implication in both cases. An Interim Report should be rendered within a month from the inaugural date while the final report, with useful recommendations, should be submitted to the Committee within two months. The Committee Report concluded that as of 28 May 1994, no significant effort had been made towards the achievement of these Terms of Reference, simply because there were no funds. The absence of any progress informed the action of government to inaugurate another Technical Committee on Wrecks in Nigerian Waters on July 10, 2002 to address the issue. Almost ten (10) years after the last effort, the wreck situation in Nigeria waters has worsened, yet there has been no serious wreck removal effort since this period. Equipment problems such as the lack of positioning system in some areas, and total absence of sounding, and side scan sonar equipment. To collect up-to-date hydrographic survey data and to satisfy the maritime constituency, Humber Marine Werks Ltd developed a survey priority plan to identify those areas with the highest risk of serious maritime accidents. This risk assessment is based on a combination of traffic volume, inadequacy of charts or surveys, and potentially insufficient underkeel clearance. More modern technologies were implemented to increase the quality and productivity of the survey. This included the detection, location, and identification of wrecks and obstructions primarily using side scan sonar, magnetometer, and Differential GPS technology. The strength of the return echo is continuously recorded creating a "picture" of the ocean bottom where objects that protrude from the bottom create a dark image (strong return) and shadows from these objects are light areas (little or no return). The standards adopted for the entire survey conforms to the National Ocean and Atmospheric Administration (NOAA), National Ocean Service (NOS) Hydrographic Surveys Specifications and Deliverables. These technical specifications detail the requirements for hydrographic surveys to be undertaken by either NOAA field units or organizations under contract to the Director, Office of the Coast Survey (OCS), NOS, NOAA, U.S. Department of Commerce. The specifications are based in part on the International Hydrographic Organization’s Standards for Hydrographic Surveys, Special Publication 44, Fourth Edition, April 1998, especifically for Order 1 surveys. Hydrographic surveys classified as Order 1 are intended for harbours, harbour approach channels, recommended tracks, inland navigation channels, coastal areas of high commercial traffic density, and are usually in shallower areas lower than 100 meters depth. Hydrographic equipment - Consultants-Inner Space Technology, New Jersey, USA. All positions were referenced to UTM Zone 31. This datum was used throughout the survey. Documents used for comparisons, such as charts, prior surveys, and junction surveys were referenced to or adjusted to UTM Zone 31. All software used on the survey contained the correct datum parameters. All sounding data were reduced to chart datum, or 0.38 meters below BM1 at East Mole Signal Station. Local time was used for all time records. Total error in the position of soundings, dangers, and all other significant features, at 95% confidence level, was +/- 5 meters + 5 percent of the depth. GPS receivers were configured such that satellites below 10° above the horizon were not used in the position computations. A minimum of four (4) satellites was used to compute all positions. There were always more than six (6) satellites 95% of the time due to clear visibility. Horizontal Dilution of Precision (HDOP) was monitored and recorded, and did not exceed 4.0. Depths were recorded in meters, with decimeter precision. Plotted depths are also in meters and decimeters. Observed echo sounder depths were corrected for all departures from true depths attributable to the method of sounding or to faults in the measuring apparatus. These include draft, velocity, heave, roll, pitch, heading, and navigation timing error corrections. Tide stations were set up at NPA Dockyard, Apapa & Navy P4 Jetty, at Victoria Island. Readings were taken at 30 minutes interval throughout the duration of the survey. Side scan sonar was used for supplementing echo sounding by searching the region for additional indications of dangers and topographic irregularities. Confidence checks of the side scan sonar were conducted once a day. Confidence checks were also made during the course of survey operations by noting the check feature on the sonargram. Safety meetings, which focused on potential hazards associated with inshore marine operations, was conducted prior to the commencement of the survey. General safety awareness among entire crew members was commendable. No Lost Time Injury (LTI) was recorded during the period under review. 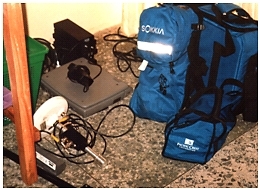 The positioning method used for the survey was Sokkia Global Positioning System (GPS) receiver interfaced with HYPACK navigation software to compute vessel position from direct satellite observations to get the actual position. The navigation system comprised a Compaq Computer driving a printer and a dedicated monitor for the helmsman. The computer received GPS derived coordinates in WGS84 from the Sokkia system to output the final grid coordinates in Universal Transverse Mercator (UTM) Zone 31. Navigation was conducted with no smoothing applied to the position computation. The HYPACK navigation system software provided display presentations suitable for navigating predetermined lines and included a visual aid for the Helmsman. GPS antenna was used as the Positioning Reference Point (PRP) for the survey. All other sensors like side scan sonar and magnetometer tow points offsets were measured and cable out documented for data/records post-processing. 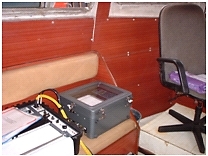 The HYPACK system was interfaced with the echo sounder, this enabled raw depths to be recorded in real time and event marking appropriately carried out. Fix intervals were at 50m for all the sensors and logged in the analogue traces as well as in the hard disk for onshore post – processing. 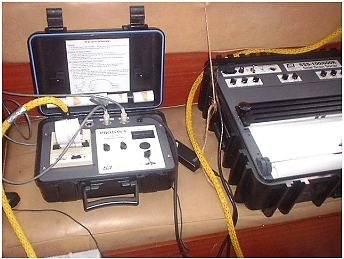 Odom Hydrotrac dual frequency (33 KHz/ 210KHz) digital / analogue recorder was used for survey. The over the side mounted transducer shoe was marked at 1m intervals. The transducer was installed rigidly to its bracket and side mounted on the survey vessel. The transducer shoe was sufficiently deep and well positioned not to experience turbulence and aeration from the vessel during data acquisition. The depth of the transducer below waterline was guided by the calibrated marks on the transducer pole. Odom Hydrotrac Echosounder onboard survey boat. J.W.Fishers side scan sonar system was used for the survey. 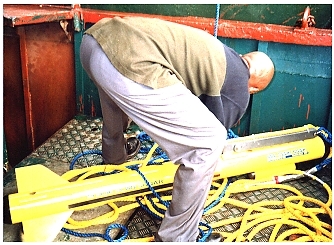 During mobilization, the tow cable was measured and calibrated at 1m intervals to three times the maximum operating depth throughout the survey. The recorder was set to 100m to 200m ranges, ensuring a theorical 100% overlap on lines ran. Cable out, and range scale were noted at the start of each line, and whenever alterations were made. Preparing the side scan sonar for deployment. The magnetometer data was acquired with a JW Fishers Proton - 4 magnetometer. The data was displayed on a chart paper. The magnetometer was towed 5m astern of the vessel at approximately 2m depth below the waterline and operated on the 32,000 – 33200 nanoTesla (nT) range. The magnetometer and side scan sonar consoles. Daily progress reports were maintained onboard and regularly reviewed by the Party Chief and the Survey Representative. The on – line computer system was interfaced for closure to all analogue and digital recorders. Event marks corresponding to position fixes were generated automatically from the navigation computer interface, and passed to the analogue records at fixed intervals set at 50m. Field data were processed using appropriate survey software such as HYPACK, HydroCAD, SurvCAD, AutoCAD, GPS Pathfinder Office, etc. GPS positions were processed and differentially corrected in the coordinate system: UTM Zone 31. Tidal corrections were applied to soundings and reduced to chart datum or 0.38m below BM1 at East Mole Signal Station. For purpose of the survey, the Lagos Ports Area was divided into 5 blocks namely, Sheets 1, 2, 3, 4 & 5, plotted on scale 1:5000. In addition, a composite chart covering the entire area was produced on a scale of 1:12,500. Each wreck site is highlighted in the chart with symbol of wreck and a number printed in red colour (e.g. Wrk 12). Database of the wrecks, their positions, and other attributes was designed and created using Microsoft Access. 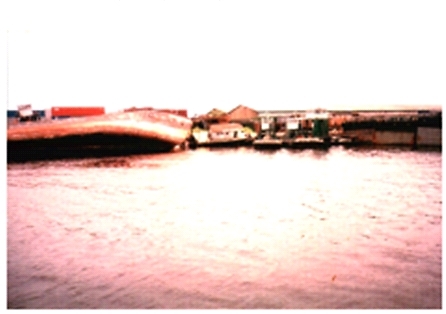 Water depth in the surveyed area varies from a minimum of 1.1 metres in the Kirikiri area to a maximum of 24.0 metres in the Lagos Port Limit in the Lagos Bar. 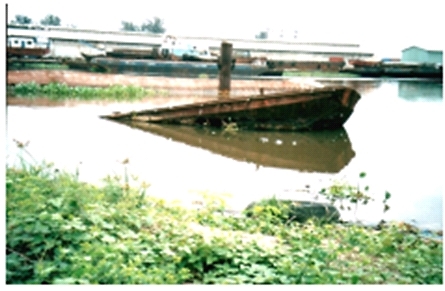 One hundred and two (102) wrecks were located at sixty-two (62) wreck sites within the Lagos Ports Area under survey. Another seven (7) wrecks were located in the Lagos Bar, making a grand total of one hundred and nine (109). Some of the sites may have a cluster of two, three or more wrecks. Each site is numbered with a pre-fix “Wrk” and the number of wrecks at a site may be determined from the database. About twenty-one (21) wreck sites have wrecks either fully or partially submerged. At least three (3) of the wreck sites were marked with marker buoys. 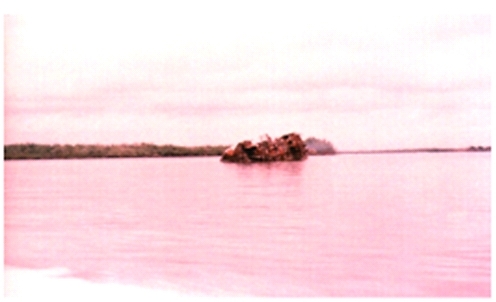 Three portions of the Lagos Ports Area were identified as numerous wreck areas. Wrecks are highly concentrated in these places. 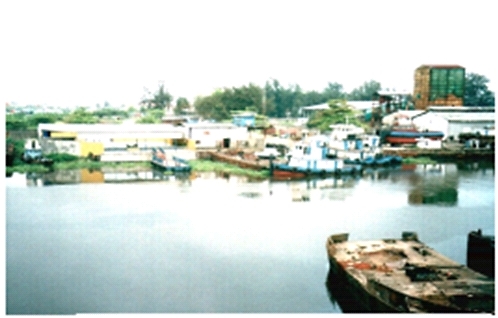 Badagry Creek Bay (Sheet 3): This area is opposite the Porto Novo Creek. Several wrecks are found here. In addition, Buoys 30 & 32 have drifted to this bay. The present positions of the drifted buoys, and litter of wrecks in this area are capable of misleading vessels navigating the channel. Snake Island Bay (Sheet 5): This bay overlooks the Tin-Can Island Turning Basin. Numerous wrecks were found here. Kirikiri Channel (Sheet5): It would be difficult to establish, on a first visit, whether the area is a fishery terminal or wreck colony. There is high concentration of wrecks on this creek, right from the entrance. Some of the private jetty owners on this creek have converted their jetties to wreck dumps, both on their waterfront, and ashore. Our preliminary estimate of the cost of removal of all the wrecks in Lagos Ports Area is in excess of forty million dollars (USD 40 million). However, it is recognized that funding could be a major constraint. Therefore, we prepared a “Danger to Navigation Report”. It lists, by sections, wrecks which constitute the greatest risks to navigation and which should be given priority. The National Maritime Authority (NMA) should, as a matter of urgency, notify the Maritime Industry of the locations and distribution of wrecks in Lagos Ports Area, and of the dangers they pose to navigation. Determination of the modalities for the removal of each wreck or cluster of wrecks. Definition of the mode of disposal, including delineation of areas for dumping of removed wrecks. In this connection, it should be noted that metal scraps from wrecks can be sold to recover part or all of the removal costs. There is indeed, ready market for this in iron & steel recycling industry. Preparation of realistic cost estimates for the removal of each wreck or cluster of wrecks, as basis for the assessment of the quotations from potential Wreck Removal Contractors. Advising NMA\FMT on the realistic basis for determination of the economic value of the wrecks to be removed. Monitoring the performance of actual wreck removal contractors in the field. Up-date of the relevant Admiralty Charts to reflect a clean bill of health for the waterways after the wrecks shall have been removed. Innocent Ndubueze Egbuh was born on June 17, 1962 in Aba, Abia State. He studied at the University of Nigeria, Nsukka where he obtained B.Sc. (Hons) in Surveying, Geodesy and Photogrammetry in 1986. He also holds a Post-Graduate Diploma in Journalism of the Nigerian Institute of Journalism (1994). He is a member of Nigerian Institution of Surveyors, a member of GIS Consultants Association of Nigeria, (GIS Specialist Group), and a member of Geoinformation Society of Nigeria, (GEOSON). He has nineteen (19) years of engineering and field surveying practice experience, during which time he moved from field Surveyor and Party Chief in the Construction and Engineering industry to Senior Surveyor, and Assistant Chief Surveyor on seismic exploration crews. He has supervised and conducted surveys for various methods of seismic data acquisition in various climates and terrain. Project design, planning and coordination for Non-Governmental Organisations. Managing medium scale surveying, engineering, architectural, geoinformation, environmental, and development consulting company. In 1991, he was registered as a Surveyor by Surveyors Registration Council of Nigeria (SURCON). Since then he has been in the forefront of the awareness campaign of the importance of computers in the Surveying profession. He distinguished himself in professional life, and has veered into software development to assist professionals. Egbuh, I. N. (2003). “Setting Up and Operating a Surveying Business”. Proceedings of the 39th Annual General Meeting of the Nigerian Institution of Surveyors, Port Harcourt. May. Egbuh, I. N. (2004). “Setting up and Operating a Surveying Business”. Proceedings of the 39th Annual General Meeting of the Nigerian Institution of Surveyors, Kano. May. Innocent Egbuh is the CEO of AERO-GEODETIC SERVICES (NIG) LTD, a firm of surveyors, engineers and architects involved in economic and financial appraisals, feasibility studies, preparation of detailed designs, programming and supervision of construction works (post-design), and specialized in computing and drafting/ system support, GPS, GIS and Land Information Systems (LIS).